We all want a deeper prayer life, but what's the secret to actually making that happen? To many, growing our prayer life feels impossible. It's that resolution that lingers year after year and nags at our soul. We long for more of Jesus because truly, He is our source of every good thing. So why does something as small as our phone or an app keep us from praying? 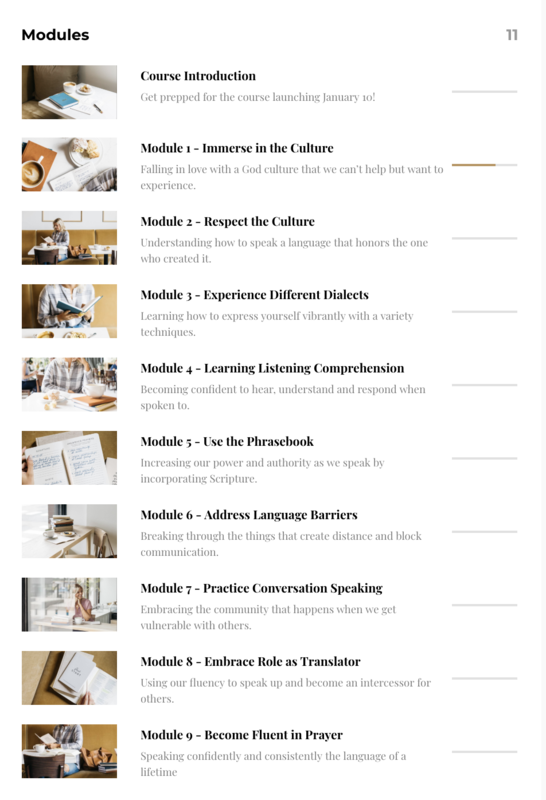 Join us for 9 modules, tons of research, Scripture and real life application as Valerie hopes to clear the fog and help you find clarity so you can become fluent in the most important and transforming conversation of your life. Efficiently packed with 24+ teaching videos and slideshows. Discussion questions to go through the course with in real life friends. Practical to-dos at the end of each module to build momentum. Tools that remove the guesswork and bring you clarity. This could be the year you find more joy in God's presence than you knew possible. This could be the year you pray boldly and see God work in unimaginable ways. This could be the year you hear Him speak clearly to you and confidently follow His plan. This could be the year of more passion and less boredom as you utter "Dear Lord..."
THOSE WHO PRE-ORDER BY JAN 9 ARE ELIGIBLE FOR A LIVE Q&A WEBINAR! Ready to become fluent in prayer? How long will I have access to the course? Can I go at my own pace? You can start it at any time after the course populates on January 10 and go at your own pace. You'll have access to it as long as the course is available, which we hope is as long as the internet will be around. 😉 But since we can't predict the distant future, what we can guarantee is having access for at least 2 years. How can I do this in a group? The course is 9 modules long, so we suggest doing one module a week! Set aside 1-2 hours during the week to watch the videos (each module's videos combined take about 20-25 minutes) and then go through your discussion questions. Throughout the week, you'll complete the listed activities individually. Going through it by yourself? Just turn the discussion questions into journaling prompts and follow the same pattern! Will there be a Facebook group or message board? We can say a very intentional "nope!" to that. We've really worked to make it possible for you to create in-real-life community around the course that will exist long after the last slideshow plays.